The new AMD technology refresh, now called AM2, will bring DDR2 memory to the Athlon64 on-processor memory controller. Many in the industry have speculated about the impact of this low latency memory controller on DDR2 performance, which to this point has suffered under the impact of the higher latency Intel Netburst architecture. We are looking forward to the opportunity to take a closer look at DDR2 performance on AM2 - which is everyone's big question. There will be more than just new memory with AM2, however. We now have details on the new Socket 940 for AM2. It has been widely reported that the new Socket 940 will not be compatible with the existing Socket 940 used for Opteron and early Athlon 64. 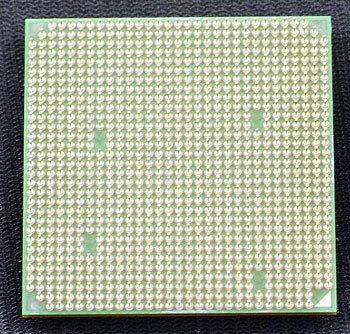 Photos of the back of the new AM2 processor show how very close the new design is to the current Socket 940. By flipping the current 940 socket photo and comparing pin-outs to the back of the AM2, you can clearly see the top 2 "lands", areas without pins, are identical in the current Socket 940 and the AM2 Socket 940. However, the bottom two lands are in different locations. The bottom right land is the same 2 pins up, but 7pins form the edge instead of the 5 in the current 940 design. The left land is also in the same row position as the current 940, but it is 6 pins from the left edge instead of 8 as in the current 940 design. The AM2 940 and current Opteron 940 are so close in design; you have to conclude that AMD could have used the same socket design. But there are numerous electrical differences and different memory is required. AMD apparently used a revised Socket 940 to prevent any possibility that AM2 chips might get accidentally mounted in current Socket 940 motherboards. That is probably a very wise decision. I´m not shure! Anyone has idea when it´s going to be released? Every news that a read says that the release date is going to later, the first time was supposed to release q2 and now july. I for one did not expect to see quite so many complaining about upgrade issues. AM2 is an evolutionary step - there's nothing forcing you to ditch your current systems. If you want them to stick with an aging platform for another few years so you have a "better" upgrade path, that's great. But the sooner they get AM2 out, the sooner people with slow systems have a new, better option. The change has to happen eventually, and no matter when it does, the complaints will be the same. When your rig is no longer sufficient, and you have to upgrade, AM2 will be there for you. In the meantime, Socket 939 is great, and if you have a single core chip, you can still drop in a dual core any time you feel you need the extra performance. The lack of OEM chips is to prevent OEM's from dumping product they got at a discount for cheaper because it was supposed to go in a complete system. OEM chips that THEY were supposed to warranty end up with end-users who tend to get a bit annoyed when that OEM chip needs to be RMA'd and AMD won't take it back. And for those who're counting, Intel's jumped from 478 to 775 and to add to it, they threw in a chipset change that wasn't backwards compatible when dual core dropped. So you potentially could have had to upgrade your chip, board and memory then have to do a chip plus board upgrade to move from 478 to Intel dual core, all in the same timeframe you could have gone from the initial 939 release to an X2 today. It is not so much abotu DDR1 holding back AMD's product, but so much that DDR2 will be the new standard, just as PC133 was eventually phased out. Albeit, DDR1 to DDR2 should not be so much as a jump as PC133 to DDR1, but it largely more ficically efficient to do so. Intel has been using (slower) DDR2 for some time now, and now that DDR2 have reached speeds where there is no penalty for using it, or perhaps a small to medium increase of performance, AMD wishes to adopt DDR2 so it can help streamline the industry. When both CPU manufacturers use the same type of memory, the memory manufactures can produce cheaper products. AMD is natorious *spelling* for making it easy for manufacturers in the industry and this helps with adoption of their product. This is besides the point that DDR2 has lower power requirements than DDR1, which is very important for the mobile sector, it is not feasible for AMD to only adopt DDR2 for its mobile sector and negate its desktop and server platforms, nor is it realistic considering AMD's model of creating products is a Server down platform. All products derivitive of the original "beefiest" chip. This is why the entire platform is getting a change to DDR2, and it is an inevitable change. If you just bought a dual Opteron system a few months ago there is no need for you to upgrade anything at all, AM2 is for single socket consumer grade systems anyways, why would you even look at it if you're already needing something from the dual socket market? Anyways... they can't scale DDR1 anymore and its getting more expensive as DDR2 ramps up in production. DDR2 still has a way to scale before its EOL'd so we should see some significant performance gains before it goes the way of the dodo and DRR3 comes out. I'll take whatever they give me as far as heatsinks are concerned. Personally I am looking forward to the Pacifica virtualization 'enhancements' to make it easier to play around with software. Currently I use Xen, but the only systems that support it on the current generation x86 systems are Linux and FreeBSD (which is fine). But with Pacifica or Intel's VTs then I can use whatever I want to use. Windows, OS X, ReactOS, OpenBSD, FreeBSD, Dragonfly, etc etc etc. I don't care about cpu speed or memory speed. I just want the ability to use lots of cheap RAM and multicore/smp would be a plus. Not as much info as I had hoped for. I was a bit disappointed when I read that most current A64 heatsinks will not be compatible with AM2 and the new socket, but then a previous user pointed out that Thermalright and the like are usually pretty quick to make socket adapters for new socket changes. Spending $5 for an AM2 s940 adapter for my SI-120 is much better than me having to use whatever stock HSF comes with new AM2 processors or buying a whole new HSF.